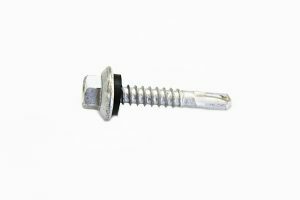 These screws are designed for fastening metal wall and roof panels used in metal construction. Flange heads are designed to encapsulate EPDM washers, providing a secure seal. Fastener head design includes nutsetter ledge for better drivability. These screws are available in 25 standard colors or custom matched to your specific needs. Download a list of our standard colors, or contact our sales team to discuss how we can create custom colors. NOTE: Self drilling screws should NEVER be installed with an impact tool and should NEVER exceed 2500 RPMs. Impacts can damge paint and compromise the integrity of the screw. Size Threads per Inch Drill Point Drive Carton Qty.